A well made whip made from PU leather. GREAT FOR USE AS A PROP. Approximate Length from tip to tip including hooped handle is: 52.5 cm. We do not gain from this financially. A very good quality antique man-sized hunting whip / riding crop. English, Circa 1840. The crop therefore dates to around 1840. Good condition. Handle is 10 cm long. 10 crop whips 65cm in length in various colours, with keeper and plastic end tab. Genuine Cowhide leather Black thick hard tails whip leather flogger. Flogger crafted from top grain beautiful and finest very strong leather strip. Number of tails 24. Hand Made item. THE INDIANA JONES HUNTER WHIP. This is a luxurious item at a rock bottom price. Genuine Real Leather. 10 Feet Long. MADE FROM GENUINE REAL LEATHER. Beautiful and fine Leather braided knobs. Fully Hand Made and durable item. EEGEE WHIP. Riding crop / slipper. total length approx 64cm. Good Condition. WEIGHT 50 GRAM. The whip has a very intense impact while using. Hand Made item. · 4 Feet Long 8 Plait weaving bull whip. Material: Genuine Cowhide Leather Whip. · Genuine Cowhide Leather. · AZO Free Leather Cow Hide. · Beautiful and fine Leather braided knobs. Genuine Cowhide leather Red & Black thick hard tails whip leather flogger. Flogger crafted from top grain beautiful and finest very strong leather strip. Number of tails 24. COUNTY England Genuine HORSEHAIR Fly Whisk Crop Whip~Shoo Fly~Leather Handle~NR! Made in England. HIGH QUALITY GENTLY USED~ COUNTY~MADE in ENGLAND~ GENUINE HORSE HAIR FLY WHISK / RIDING CROP / WHIP~ BAMBOO & LEATHER HANDLE~ NICE CONDITION~ NO RESERVE . 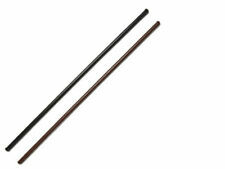 It is made with leather wrap handle and bamboo shaft. Cowhide Black and Red leather flogger. Genuine Cowhide leather bull whip is crafted from top grain beautiful fine heavy strong leather. All are made by our skilled craftsman. Genuine Cowhide leather. 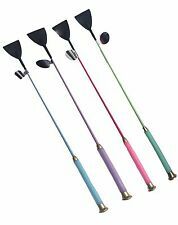 Amazing Gel Soft Grip Handle Crop Horse Riding Whip 65cm 8 Colours!! Size:03 Feet long, 16 plaits weaving bull whip. AZO Free Leather Cow Hide. genuine cow hide leather. Fully Hand Made and durable item. Selected Leather is quality Leather. MADE IN ENGLAND. QUALITY MADE. Knight Rider Horse 39" Training Whip. Quality gents hunting whip. cant make out 1st word. think 2nd is "Lined".Bone handle. Full leather bound shaft. Whipping & keeper very good. examine the photos carefully. Rare threads coming undone size 660. 1931 HARRISON & CO LEATHER RIDING CROP/WHISK. HALLMARK STERLING SILVER. Horsehair and hallmarked sterling silver (London) riding crop/whip/whisk. In good condition - total 77cm long. Crop only 33cm long. Suede leather black flogger. Genuine suede leather bull whip is crafted from beautiful fine heavy strong suede leather. All are made by our skilled craftsman. Genuine suede leather. Number of tails 36. 25 pieces of Tails are 1.2 cm wide and 18" long of thick rich cow skin leather. 9" long Beautiful Real Leather braided sturdy Handle inside wood. Beautiful and fine Leather braided knob. Weight is 250 grams. A BARGAIN BLACK FLEXIBLE RIDING WHIP AROUND 24" BODY £2.99 HORSE RIDING AND ??? BLACK FLEXIBLE RIDING WHIP. FOR RIDING HORSES AND WHATEVER! WATFORD WD24. 3.5 cm wide single tails flogger. The whip has a very intense impact while using. Beautiful and fine Leather braided knob. Top grain leather beautiful sturdy leather handle. Flogger crafted from top grain beautiful and fine Suede leather. Thick rich and soft whip is crafted by skilled craft man. Red and Black Beautiful 8 plated 4 Black and 4 Red. 25 Pieces of Tails are 2 cm wide and 18" long of thick rich cow skin leather. 9" long Beautiful Leather sturdy Handle inside wood. Beautiful and fine Leather braided knob. Color as per the picture shown. 08 Plaitweaving bull whip. Genuine Cow Hide Leather. Genuine Cow Leather. 08 Feet Long. Total Length including loop and tail is 9.6 feet. 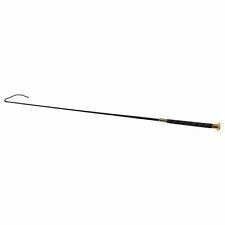 Braided leather riding crop lash. Dark brown. Cowhide Black leather flogger 36" long hand made single bull whip. Genuine Cowhide leather bull whip is crafted from top grain beautiful fine heavy strong leather. Genuine Cowhide leather. NEW Driving Whip - 53"